In this post, I’m going to talk about one of the new mechanics we’ve been working on; but first, a little background. Starsector has been designed starting with the combat layer and working up, and this has both up and downsides. We get to work out the combat layer first, and make reasonably polished releases with combat as the centerpiece – that’s a good thing. On the other hand, this means that as the campaign comes into focus, we can either 1) force it to fit in with how combat currently works or 2) adjust the way combat works to make it a better fit for how we want the campaign to work. Enter combat readiness (“CR” henceforth), a mechanic specifically intended to improve the connection between the campaign and combat layers. There are already mechanics that link the two – for example, the persistent fleet, ship damage & repairs between battles, and character skills. So, we’re not talking about anything radically new; just taking stock of what’s there and cleaning it up, smoothing over the rough edges. While this involves some changes to combat mechanics, the goal is to enable the campaign to exert a greater influence on combat (and vice-versa), rather than to rework combat for its own sake. We’re giving the campaign tools to work with, levels to push, knobs to turn, analogies to abuse. Conceptually, CR represents weapon and system maintenance and repair, securing the magazines, making sure there are no cargo crates knocking about in the hold, that sort of thing. In-game, it’s presented as a percentage. A good way to think of it is as a “stamina” mechanic on the campaign level. First of all, the maximum CR for a ship is determined by several factors, such as the crew level and the logistics situation in the fleet. A ship with 100% CR is a rare sight (and has significantly boosted stats), while values in the 50% range are more standard. A ship with very low CR can’t be deployed for battle at all, and deploying a ship results in a CR reduction afterwards. Recovering CR consumes supplies, much like repairs do. CR can also be reduced by campaign events, such as being hit by a radiation storm or suffering an accident. What does this actually do for the gameplay? Deploying ships now effectively costs supplies, and is a risk because those ships will need some time to prepare for the next fight. So, even if the player’s fleet outnumbers the enemy, there’s still incentive to get the job done with as small a force as possible. 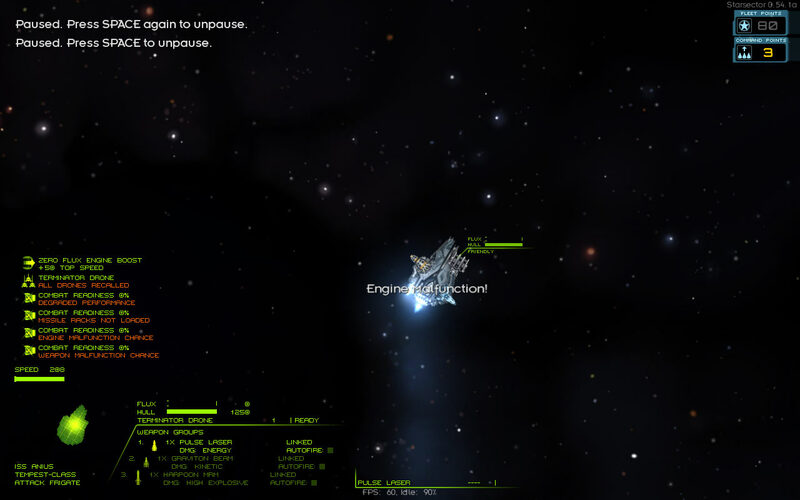 If the cost and risk are properly tuned, this can lead to challenging fights throughout the game, even if the player’s fleet has an advantage as a whole. A couple of mechanics get streamlined, too. Crew level no longer has a direct impact on ship performance, but acts through CR. Refitting ships no longer has an entirely separate timer with obscure rules like “no hull mods take effect until a refit is finished”. Rather, a refit just knocks the CR down, based on how extensive it was. In general, CR gives the campaign a way to affect ships without being too blunt about it. Doing hull and armor damage to a ship just isn’t right for many situations (i.e., a radiation storm or running out of supplies), and CR covers all those situations nicely. Systems knocked offline by a power surge? CR reduction! Not enough ball bearings to keep up with wear and tear on turret 23C? You get the idea. What about the link going the other way, from combat to campaign? The obvious effect is that deploying ships costs CR, but there’s room for more nuance. For example, using missile weapons in combat could result in a greater cost, since they’ll now have to be reloaded (and, perhaps, missile weapons might not even be loaded when a ship is deployed at below a certain CR level). EMP weapons might decrease the CR of ships they hit. CR also provided a good opportunity to address a long-standing balance problem. Ships like the Tempest or the Hyperion (both high-tech frigates) can be kitted out for speed and then take on arbitrarily-sized enemy fleets, provided the player is patient enough to spend a long, long time kiting and chipping away at the enemy. This takes skill to pull off, but is still a bad combination of “boring” and “effective” (video evidence here). You want effective tactics to also be fun, and this particular hole in the design always bothered me. Now, this could be addressed by adjusting the stats of the offending frigates, but they are a lot of fun to tear about in! Taking what makes frigates distinct (i.e. speed) in the name of balance would hardly be ideal. We had a slight engine malfunction, but uh… everything’s perfectly all right now. We’re fine. We’re all fine here now, thank you. How are you? What this means is that frigates have a limited window of opportunity to do their best work, and past a certain point (when malfunctions start to occur) leaving them on the field is a big risk. Balance-wise, they can now be made faster without the fear of creating additional ships that can kite entire fleets to death. So, frigates become more distinct, as their strength becomes more pronounced, but also comes with a weakness that encourages more aggressive play. CR also gives another way to differentiate ships. For example, some ships might be more effective in combat, but come with a higher maintenance cost and a high deployment cost. The Hyperion (again) comes to mind as a good candidate. It’s an extremely powerful ship because of its teleporter, but if it could only be deployed once before needing some time for repairs, it could stay dominant in combat without becoming the universally best choice in the campaign. All in all, CR is a flexible mechanic, and lots of things fall under its domain. I should probably say that the details of the above are very likely to change as a result of playtesting and balancing. In fact, I can’t think of a single blog post where the mechanics outlined therein didn’t change at least a bit. I’m going to try something new here and shift the comments over to a dedicated thread on the forum. Keeping the discussion in one place is good, but the main reason I’m giving this a try is spam. Right now, I’ve got it set so that a comment from a new poster requires approval before showing up, but I get an email *every time* there’s a spam comment in the queue. One time, a bot was set to post literally every two minutes. That was especially fun because I was away from the computer for a while and didn’t see it right away, and lots of emails accumulated. I could turn off email notifications, but then it’d take me longer to get to legitimate comments from first timers. A conundrum! So, off to the forum we go – which has its own spam issues, but there the moderators help out, for which help I’m very thankful. Right. Please leave your comments here. This entry was posted on Tuesday, February 19th, 2013 at 2:12 pm	and is filed under Development. You can follow any responses to this entry through the RSS 2.0 feed. Both comments and pings are currently closed.